When you thought about having children, you probably thought about happily sharing your life with a little version of you. You thought about the joy and the pleasant memories you would have together. Of course, there would be tough times, but those wouldn’t come until much later. You knew that their childhood would a blissful time of peace and tranquility. But things have not been going the way that you had planned. Rather than being the angelic vision you pictured, your child is grumpy, moody, irritable and overall unhappy. If you didn’t know better, you would think that they were depressed. How could this be, though? Only adults suffer with depression, right? Unfortunately, this isn’t true. 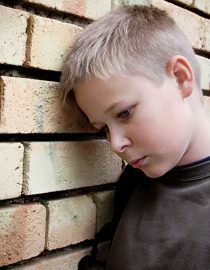 Children and adolescents have depression at higher rates than previously thought. The best course for you as a loving parent or family member is to understand the symptoms indicative of depression in children, the reasons for the onset and available treatment options to reduce the symptoms. If you take action instead of watching from the sidelines, you can still make idyllic memories before they are grown. Because there is a growing understanding of depression in children, there is a changing view of the symptoms of depression. Child and adolescents, like adults, must have at least five of the nine depressive symptoms to meet criteria for major depressive disorder (MDD). Because this disorder is usually aimed at adults, your child may have symptoms that are more appropriate for a diagnosis of unspecified depressive disorder since this diagnosis is not as strict as MDD. Feeling depressed. This tends to be the biggest indication to people that their child is depressed. Having a depressed mood means that they do not seem happy and say they feel sad, empty or hopeless. Younger children and teenagers with depression may express this mood as irritability and anger. They may be rude and hurtful to others. Less interest or pleasure in activities. Did your child love playing baseball or going to dance class but now refuses to go? If you child complains that nothing is fun or they are bored frequently, they may fit this category. Weight loss or not gaining weight appropriately. This is a symptom that is still built for adults rather than children. To have MDD, there must be a significant weight loss is more that 5% of your total weight in a month. Kids can gain weight rapidly as they grow while teenagers’ bodies are changing constantly. Because of this, put more emphasis on their eating habits and if they are gaining or losing weight appropriately. Changes in sleep. This item can be a bit confusing since teenagers are prone to sleeping until noon on Saturdays. Again, rather than focusing on amounts of sleep, look for changes in sleeping patterns. Are they sleeping more or less? Are they sleeping at different times of the day? For example, if your child is now up all night and sleeping during the day, this might be cause for concern. Motor agitation or retardation. What this means is that your child’s behaviors are either sped up or slowed down. People with psychomotor retardation will look like they are moving in slow motion while people with psychomotor agitation will look restless, fidgety and moving quickly. These changes can affect speech as well as movements. Loss of energy. This item can be hard to separate from lack of motivation and is difficult for a parent to observe. If you find that your child is unable to get out of bed or move from the couch while important tasks that they want to complete are left undone, this applies. They might report that they really wanted to go to a party or out to dinner but just didn’t have the drive to do so. Feeling excessively worthless or guilty. Parenting a child with depression can be tricky due to their guilt and feelings of worthlessness. Your child might be really sensitive to criticism or over react to a punishment for unwanted behavior. They will begin to have an exaggerated response and say things like, “Everyone hates me,” or, “I cant do anything right.” These ideas will result in lower self-worth and self-esteem for the child. Worse ability to make choices, think clearly and concentrate. This item becomes difficult when trying to decide between depression and attention-deficit/ hyperactivity disorder since poor attention and concentration are present in each. People with depression are usually distracted due to negative thinking and dwelling on issues of the past and this impacts their attention. As a parent, it can be really hard to tell the difference. Focus on death or suicide. It is very uncommon for healthy children to think that they would be better off dead or that suicide is a good idea. If your child makes statements about wanting to die or is actively hurting him or herself, seek treatment. Many teenagers with depression will engage in cutting behaviors, and although this is a serious behavior, it is not usually related to suicide.